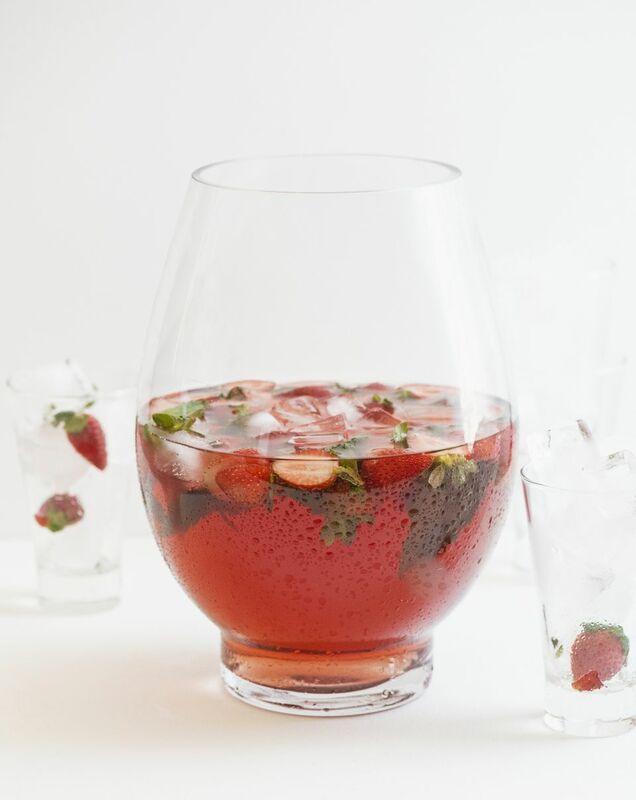 This sparkling strawberry rosé sangria may become your new go-to summer cocktail to enjoy on the patio or poolside. Sweet, sparkling, and fruity, this cocktail brings together strawberries, rosé wine, and vodka. Pretty in pink, this sangria is party-ready. Sangria is traditionally made with red wine and chopped fruit, sometimes with orange juice or brandy added. This recipe is a significant departure from that tradition in using sparkling soda, rosé wine, and vodka. Be aware that this punch packs more punch than the typical wine-only sangria due to the vodka. If you want a version with less alcohol, reduce the amount of vodka or eliminate it. A dollop of strawberry syrup will boost the berry flavor if you don't use strawberry-flavored vodka. While the recipe serves five, you can easily double the batch as long as you make it well ahead of time, as it does take two hours to chill and bring the flavors together nicely. Luckily, anything that has to be made ahead of time only makes your life that much easier come party time. In a large pitcher or punch bowl, combine the wine, vodka, and half of the strawberries. Refrigerate for about two hours to chill and to let the flavors combine. Just before serving, add the soda and rest of the strawberries. Mix to combine. If you feel it needs more sugar, you can add some sugar now but be sure to mix well. Using fully ripe strawberries will give you the most strawberry flavor. When shopping for strawberries, the small, deep purple berries are the best choice rather than the giant, often-flavorless ones. Save those big ones for a garnish for your pitcher of sangria or dip them in chocolate to serve alongside the sangria. Sangria is usually sweetened, but you can vary the amount of sugar to your taste. You can also use plain sparkling soda water rather than lemon-lime soda if you prefer. To lower the calories, you can use a diet soda or plain soda water, reduce the sugar, and reduce the vodka. Sangria probably takes its name from the Spanish word for blood, sangre. Nobody has pinpointed when sangria was first made, but it became common in the 18th century in Spain. Today, you will find sangria served at restaurants, bars, and homes throughout Spain. In the European Union, only sangria made in Spain and Portugal is allowed to be sold as sangria. That law allows it to be carbonated but limits the amount of alcohol to 12 percent by volume. Iced Hot Cocoa? Try It With Chocolate Ice!